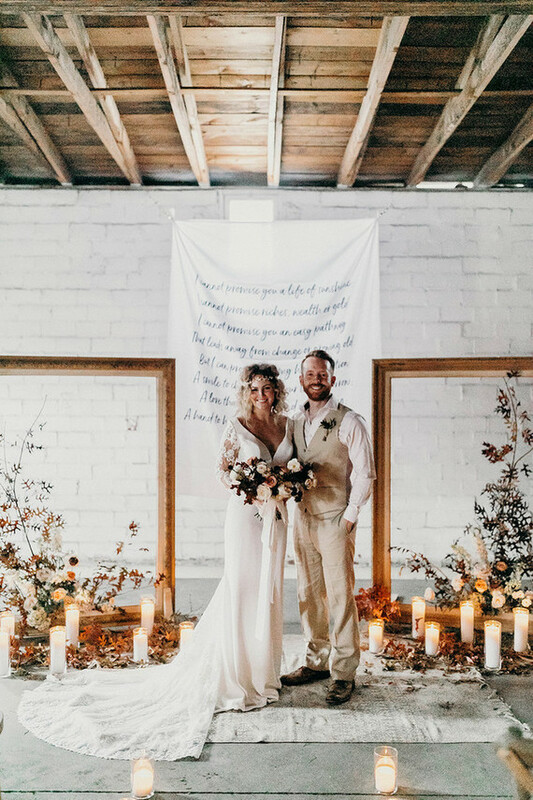 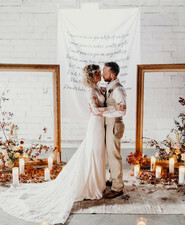 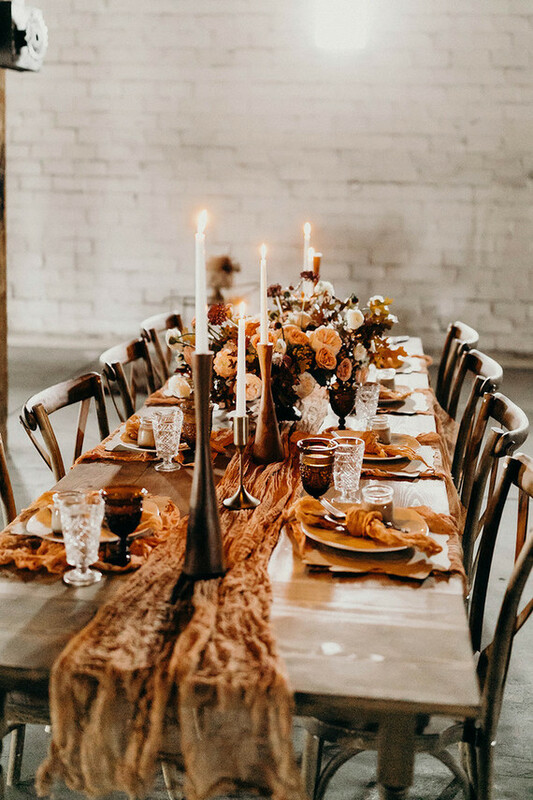 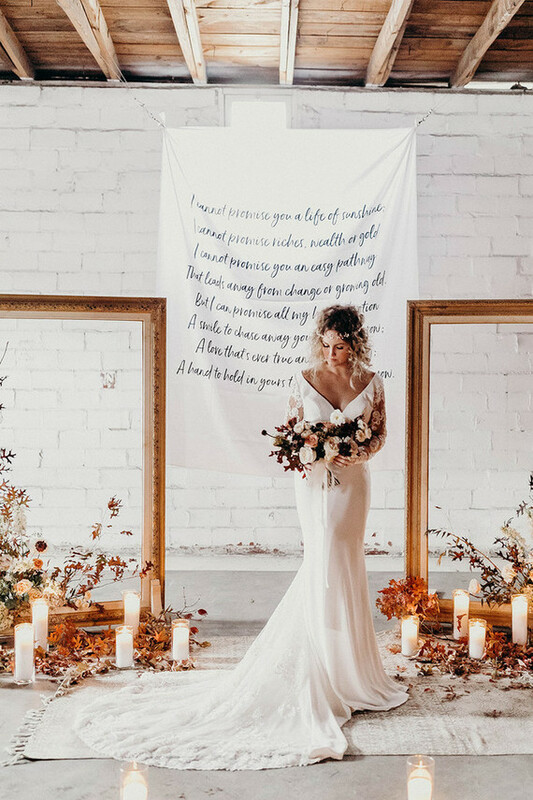 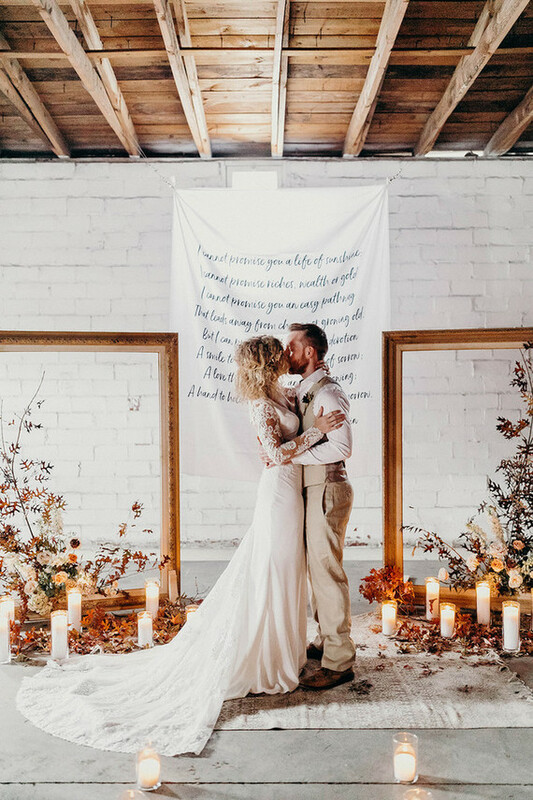 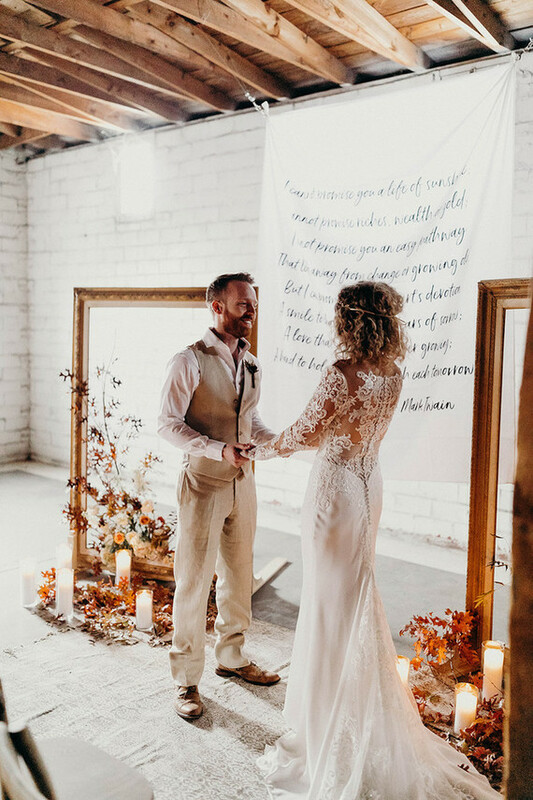 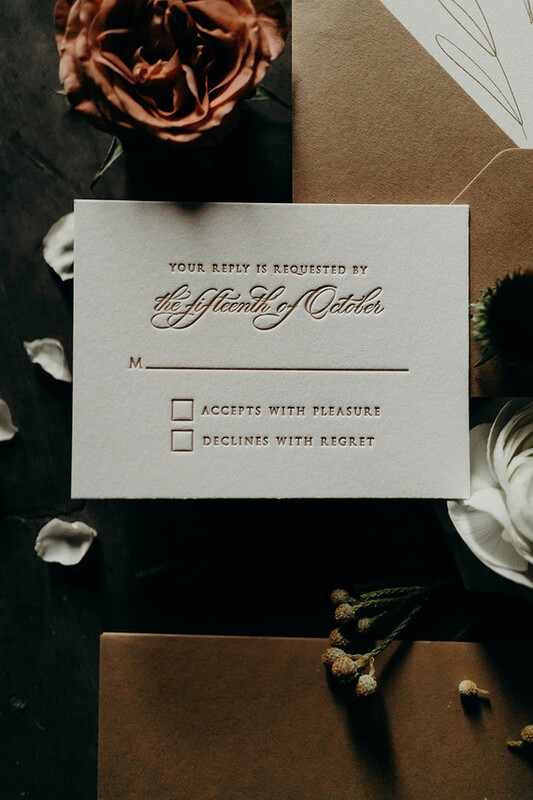 Guys, how beautiful is this fall wedding ceremony designed by Taylor of Sugar Creek Creative? 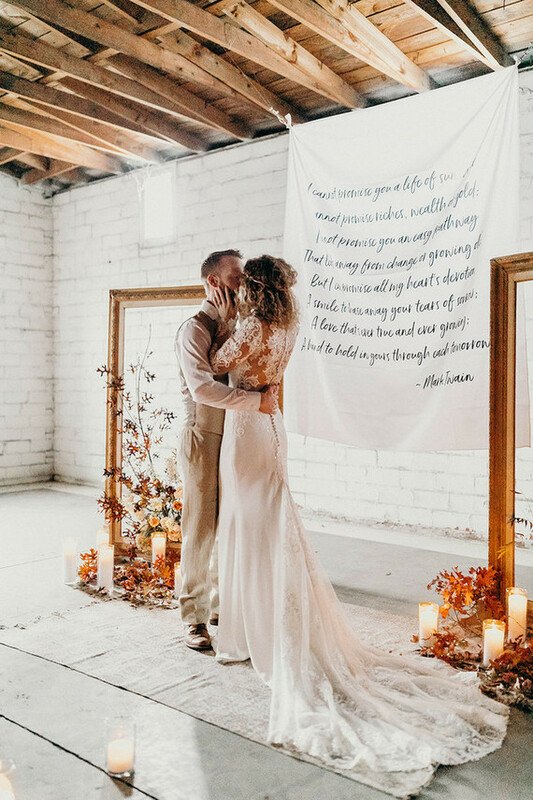 She pulled two incredible oversized frames from her own rental collection and combined it with a calligraphed literary quote for a unique modern backdrop. 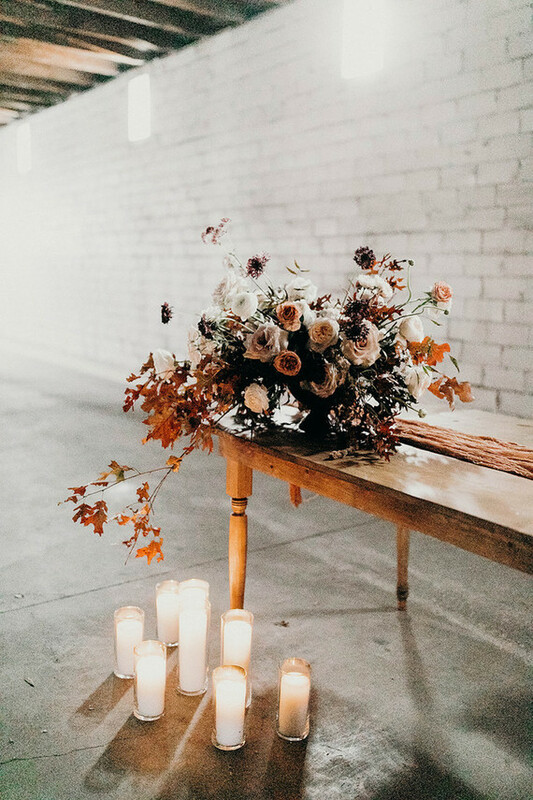 Not to mention, thse gorgy fall blooms by Vella Nest Floral Design and lots of pretty candles to take things up a notch. 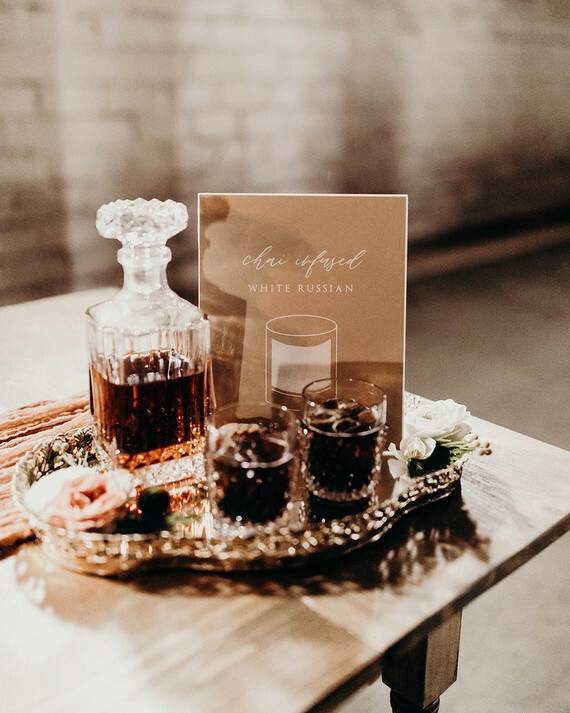 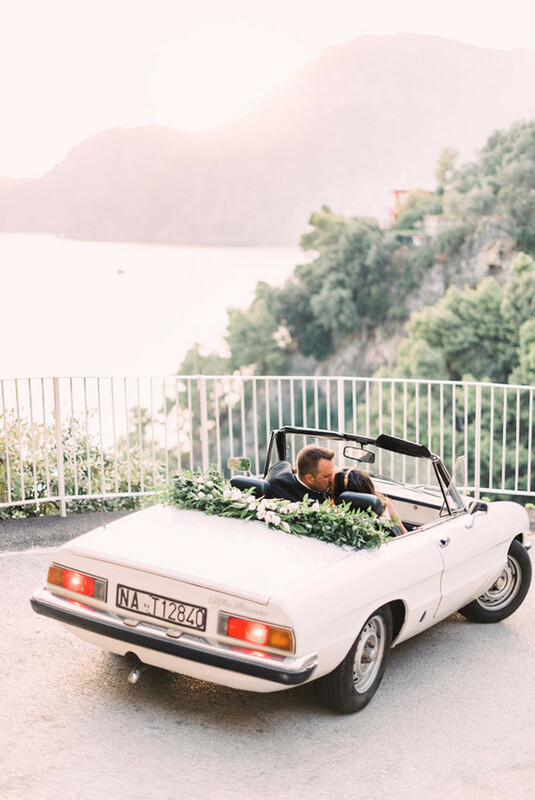 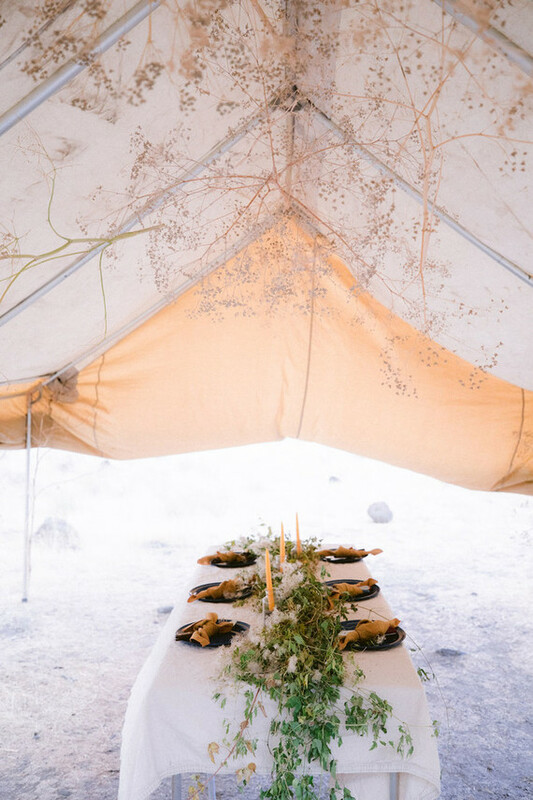 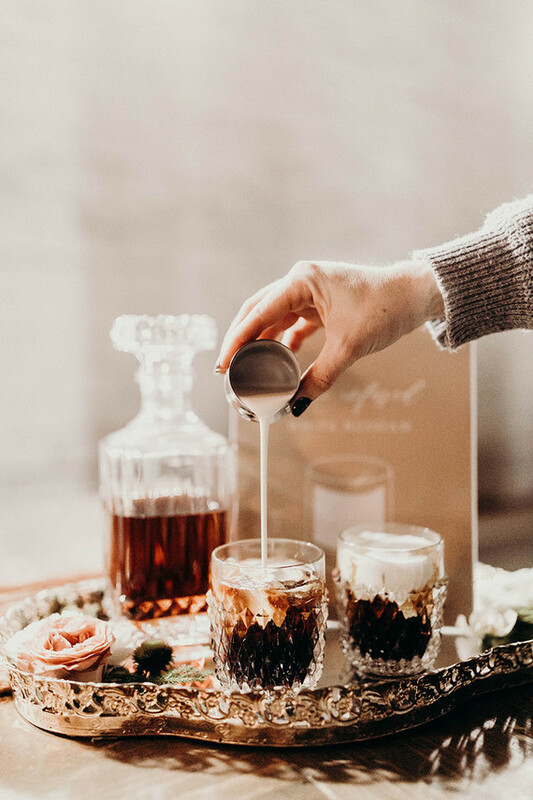 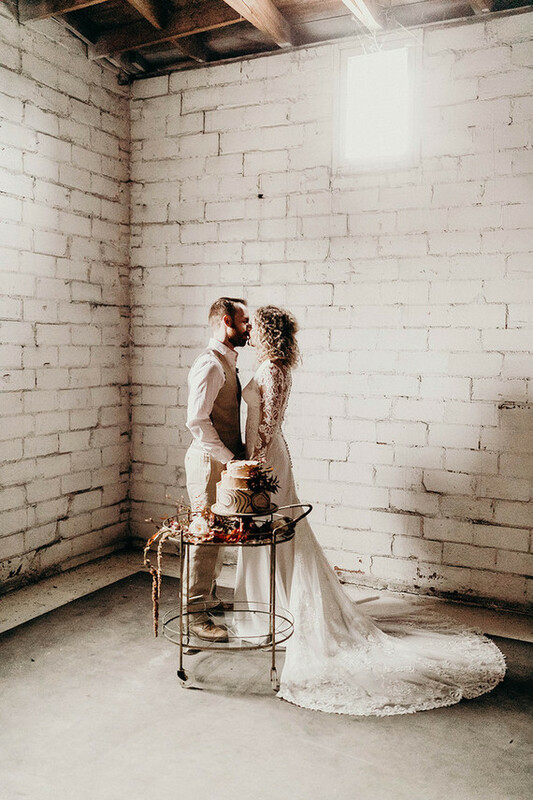 We loved how these photos Rachel L’Antigua shared could inspire a minimal, modern elopement, so we asked Taylor for a few of her top wedding planning tips. 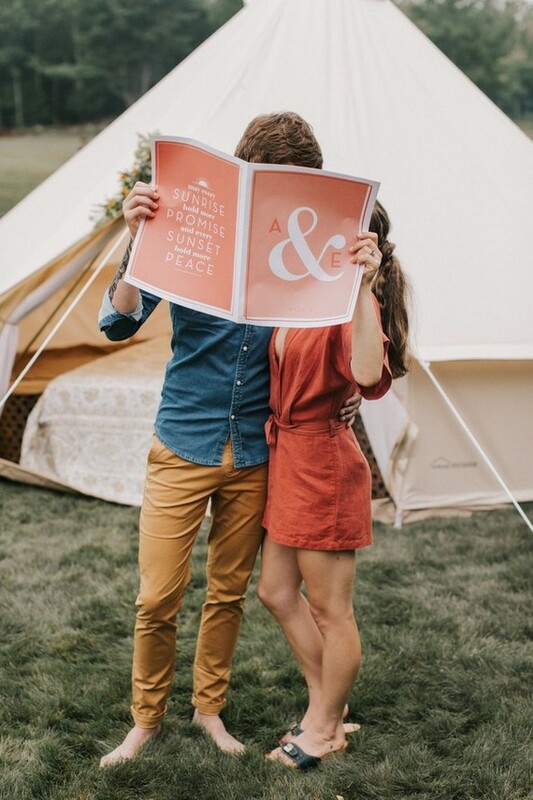 Keep reading for deets! 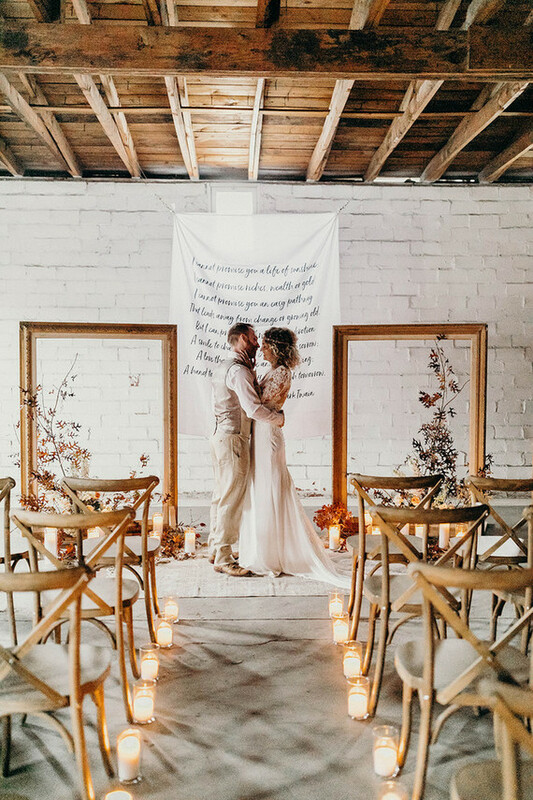 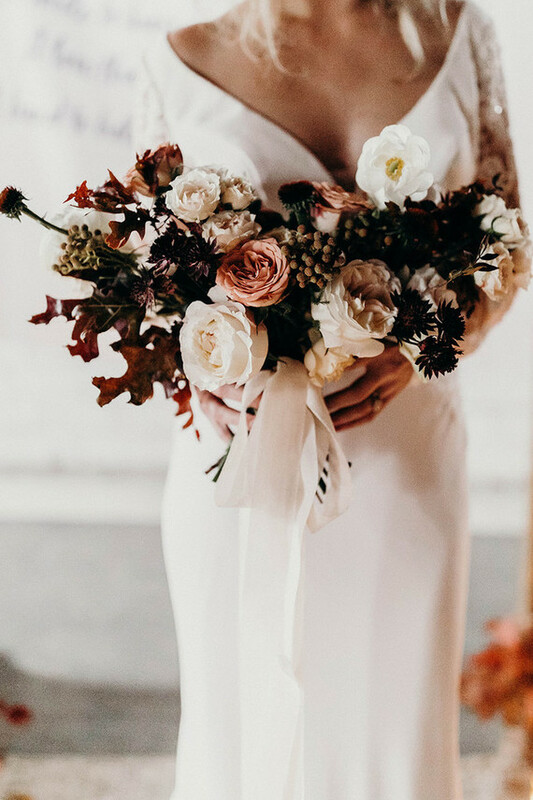 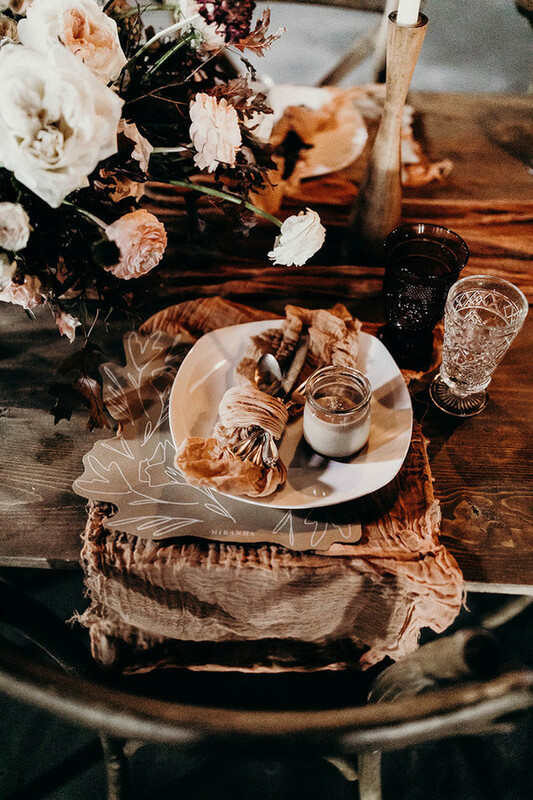 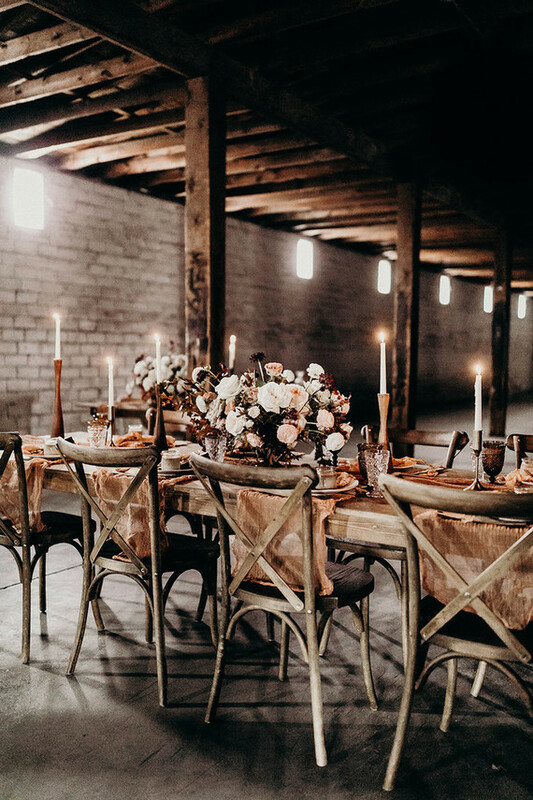 The florals and fall foliage were made to look like they were growing up from the ground, giving their indoor venue, The Ostreum in Fort Worth, an untamed look. 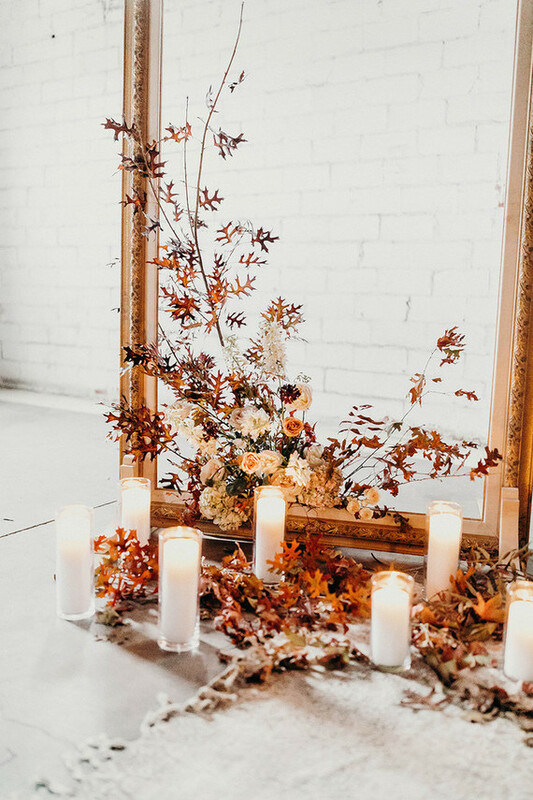 Taylor explains, When we think of fall, we think of cool weather and warm tones. 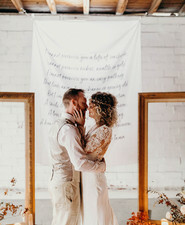 For this intimate elopement, I wanted to incorporate those same vibes. 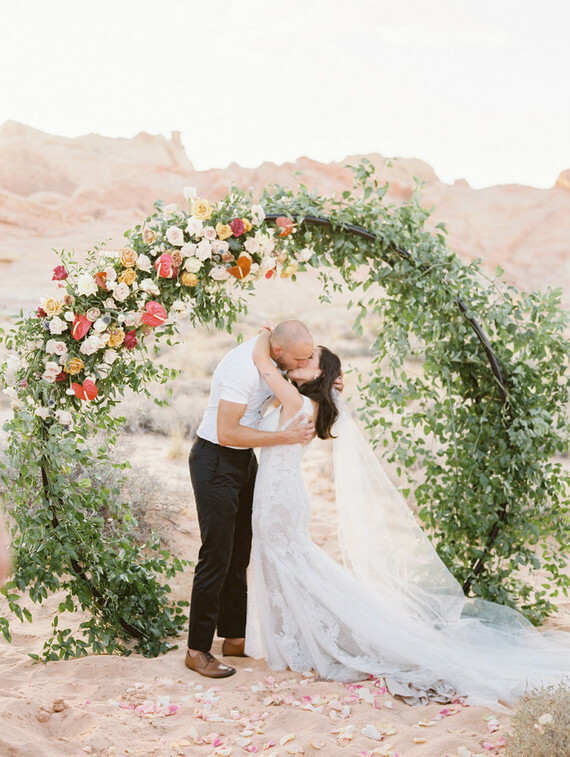 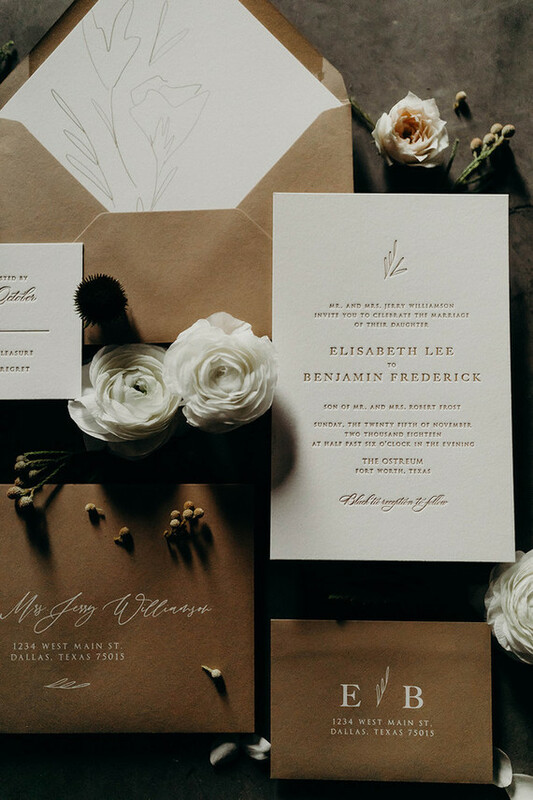 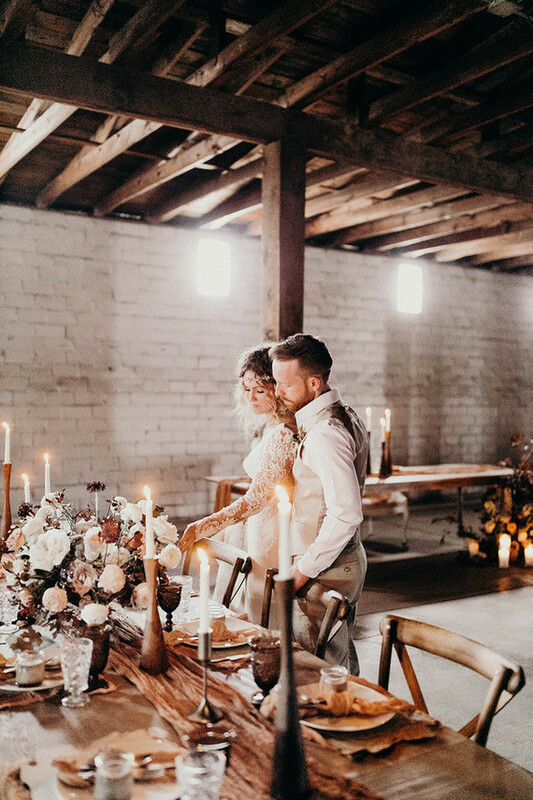 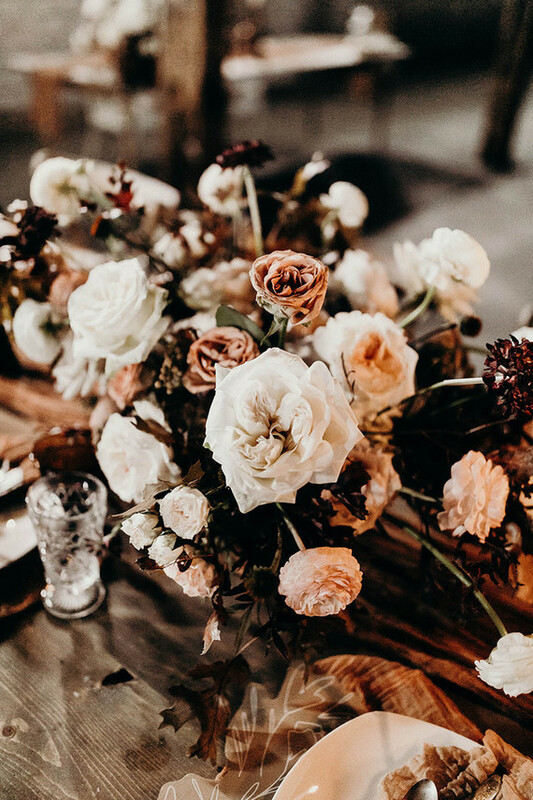 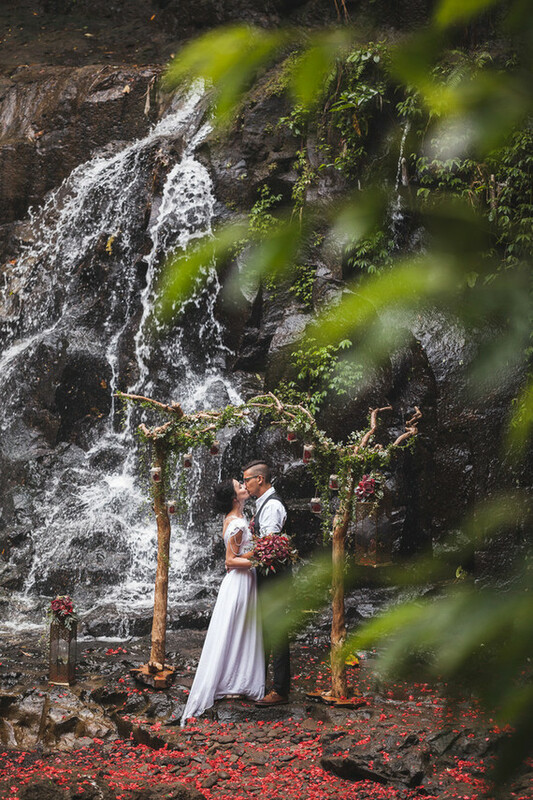 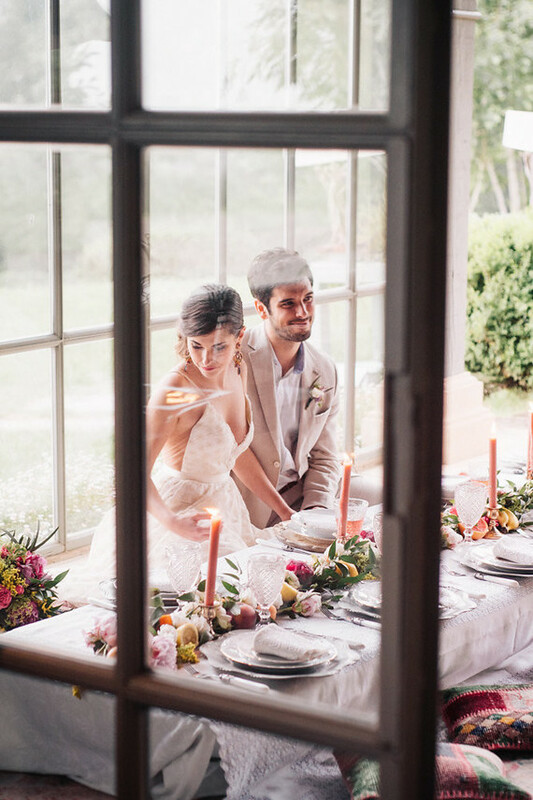 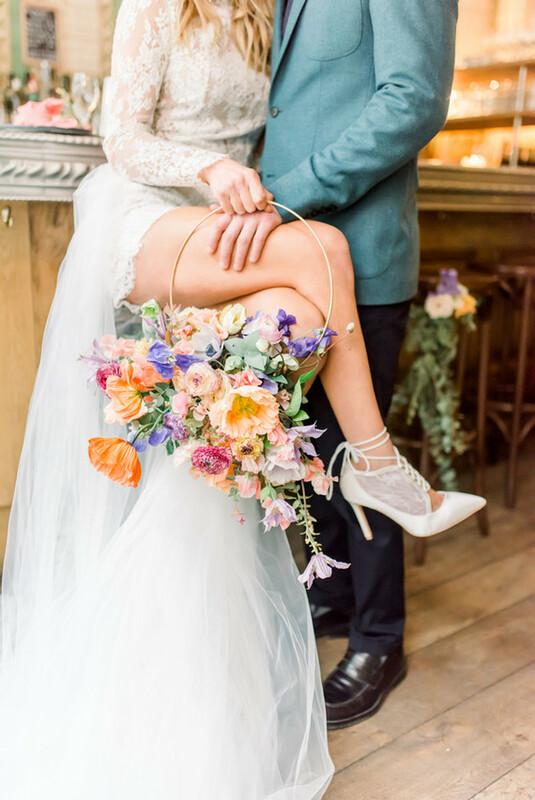 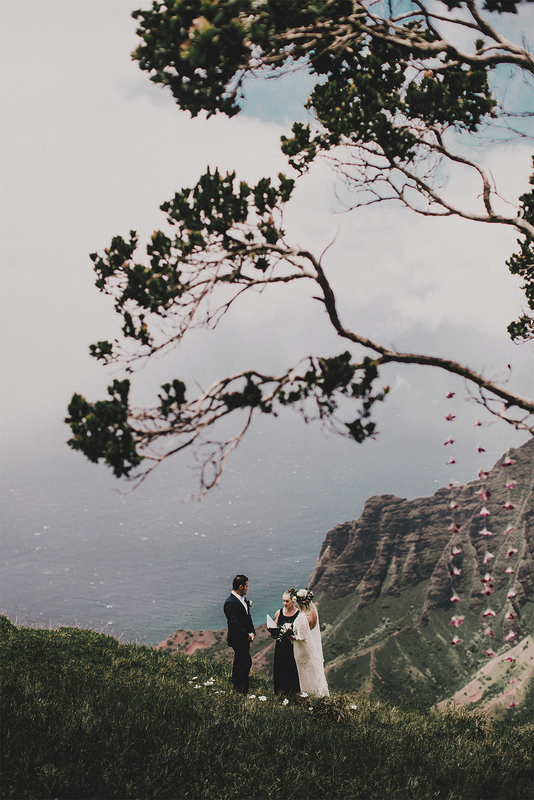 The warm, ethereal look of this elopement incorporates muted, moody floral and textures. 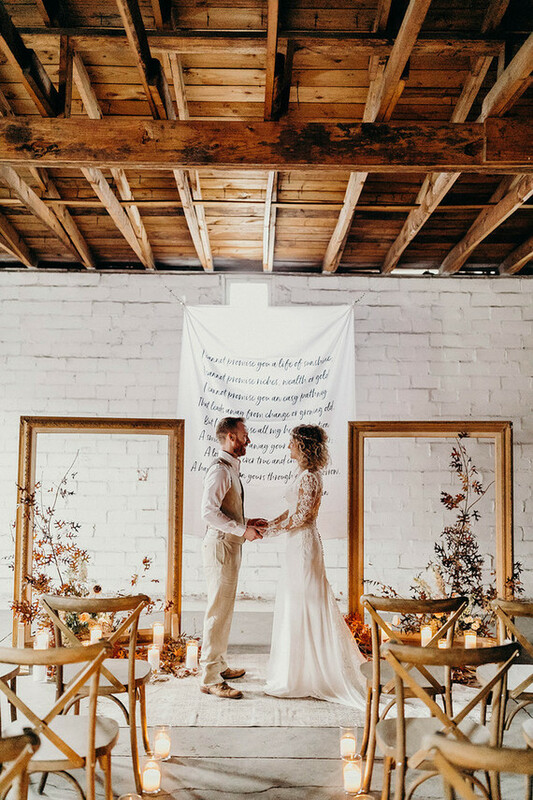 The natural beauty of outdoors in fall is hard to beat, but in an urban setting a historic, industrial warehouse is a divine alternative. 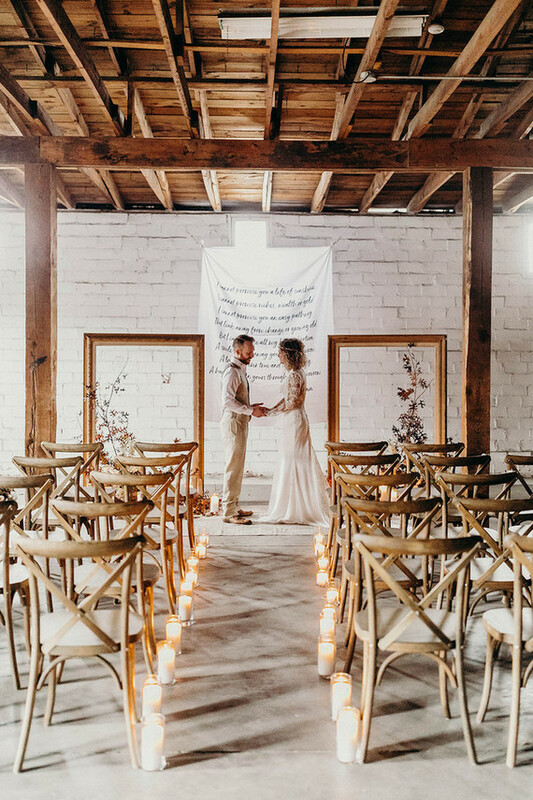 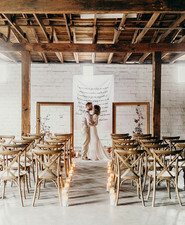 The exposed red cedar wood columns and rafters and the cream cinderblock walls play into the minimalistic look of the elopement. 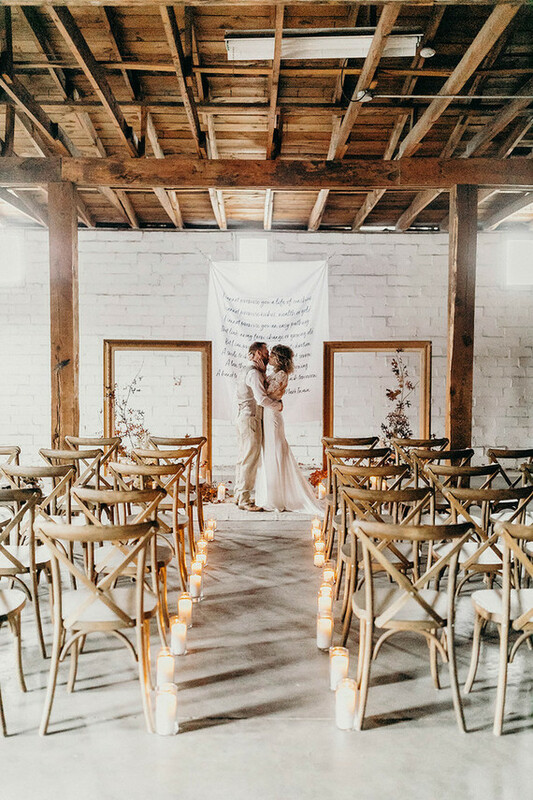 The muted, earth tone color palette and wooden elements added a warm glow to their scene. 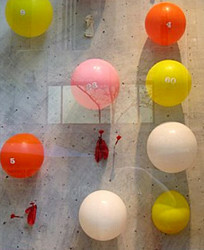 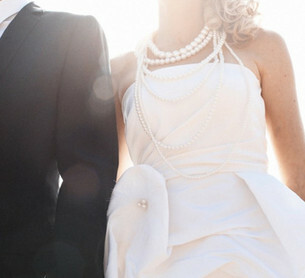 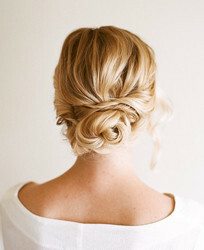 Elopements are intimate affairs, sometimes only including a handful of people. 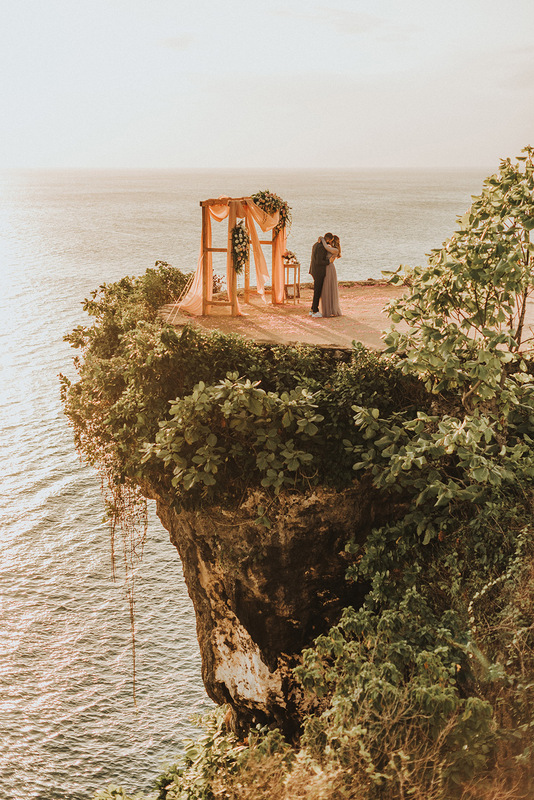 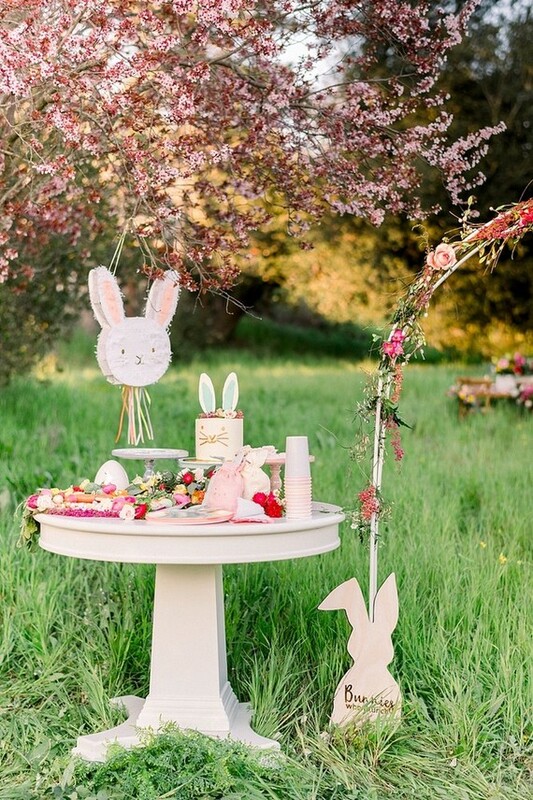 But that doesn’t mean that your ceremony setting shouldn’t be picturesque. 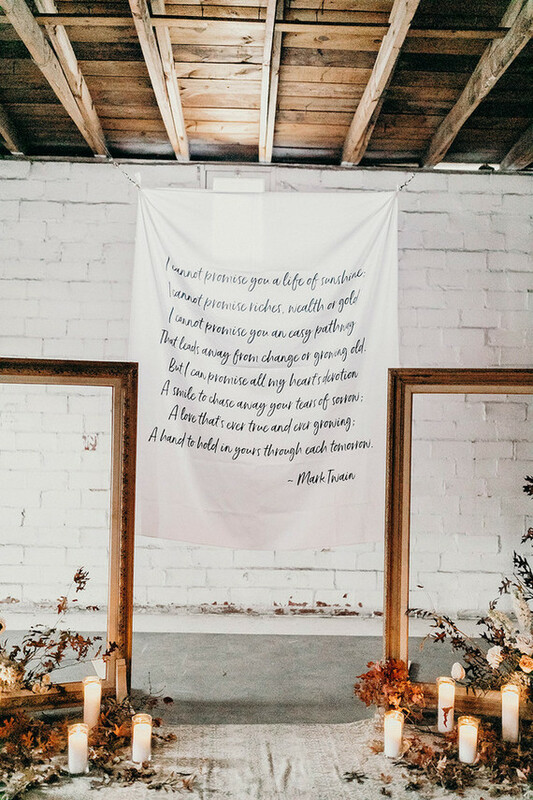 This custom backdrop with a Mark Twain quote adds a sentimental element. 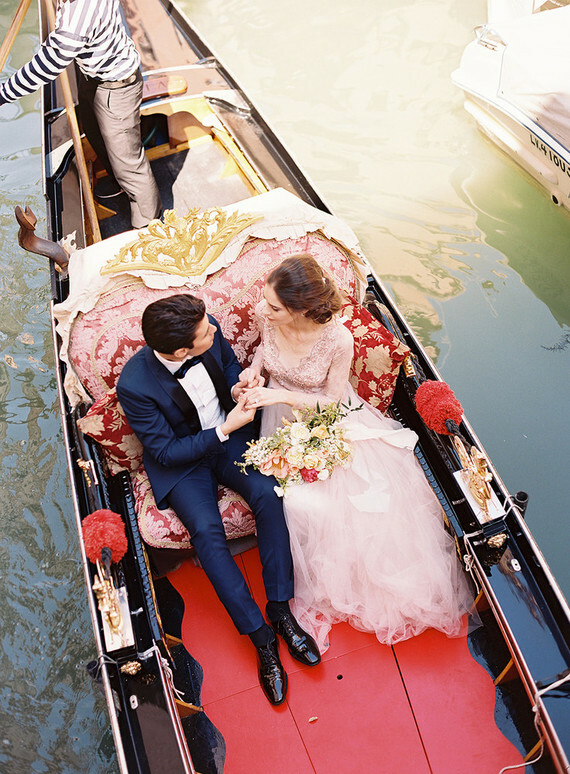 The oversize gold frames with sprawling floral pull together the setting and frame the lovers-to-be as the focal point. 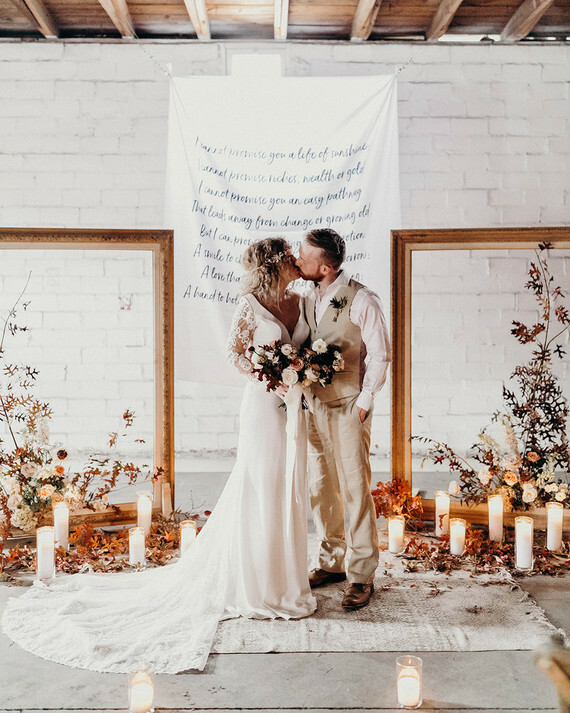 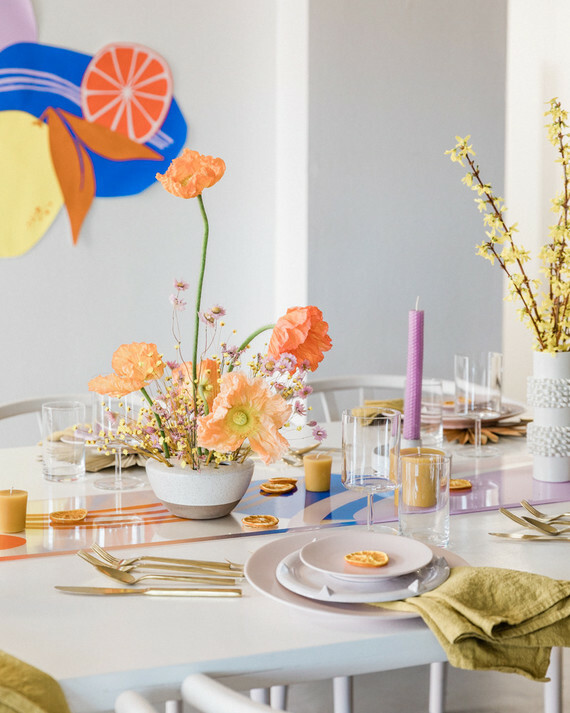 Contrasting textures like paper, cloth, florals, wood, and brass also helped evoke the feeling of fall indoors. 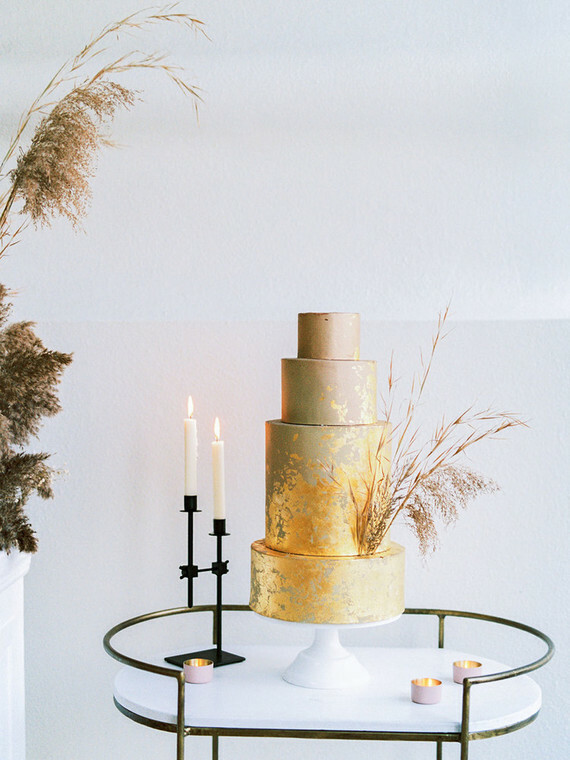 Celebrate the moment with a slice of your favorite cake. 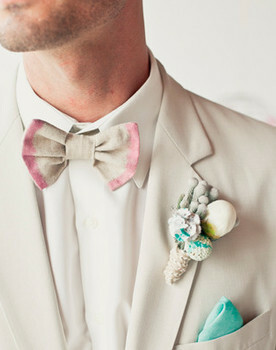 And although it might be small, that does not mean it has to be boring. 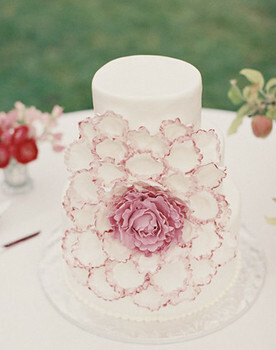 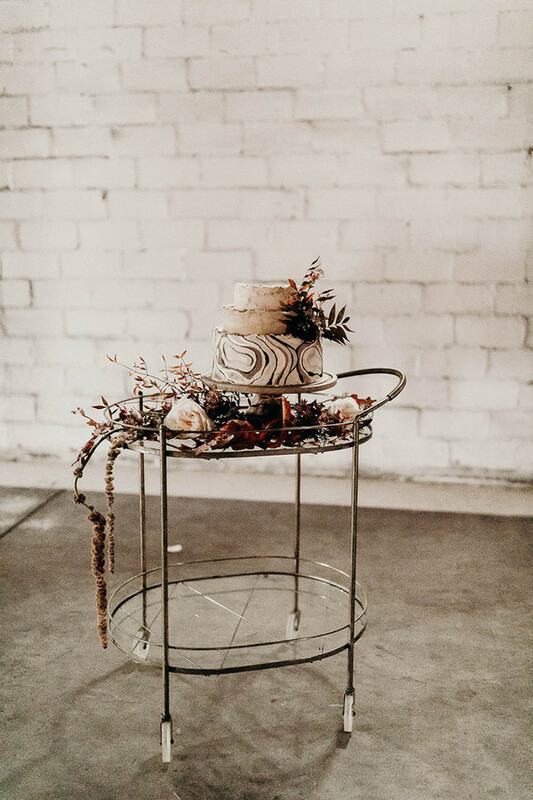 Amuse Bake Shop created a stunning modern cake with textured edges and a bottom tier that reflected mosaic art. 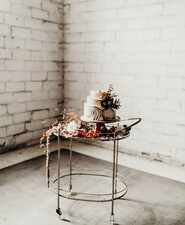 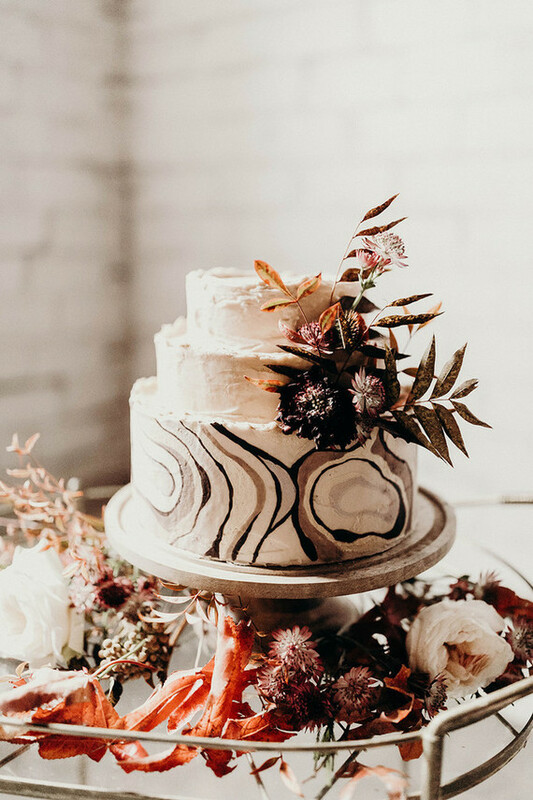 The marbling of this cake adds a touch of whimsy to this minimalistic autumn elopement.